This headstone marks sight number 6 along the Freedom trail. The Kings Chapel Burying Ground or what is left of it is situated by the busy Tremont street in downtown Boston and goes back as far as the 1st half of the 17th Century. 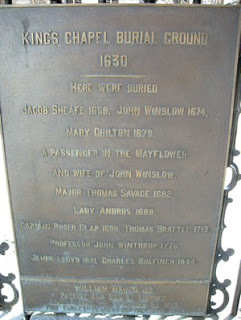 This stone commemorates among others Mary Chilton that died in 1679, a passenger on the Mayflower, that arrived in the New World 11th September 1620, daughter of James Chilton. According to legend she was the first of the passengers to step on the famous Plymouth Rock.